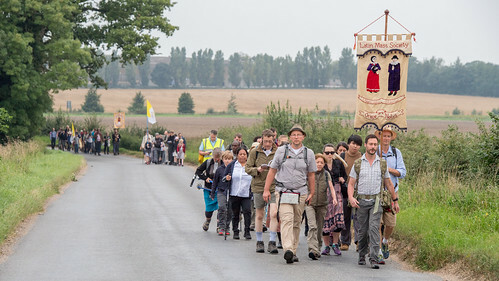 Early on Friday morning last week, about 60 pilgrims set out from Ely to walk about 60 miles to Walsingham. 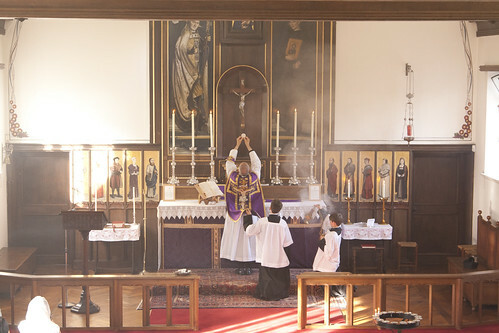 Our intention was the conversion of England, and the means we were employing to bring this about were principally prayer and penance. We didn't go by bus. We walked, because it is more difficult to walk. We wanted to do it the hard way. 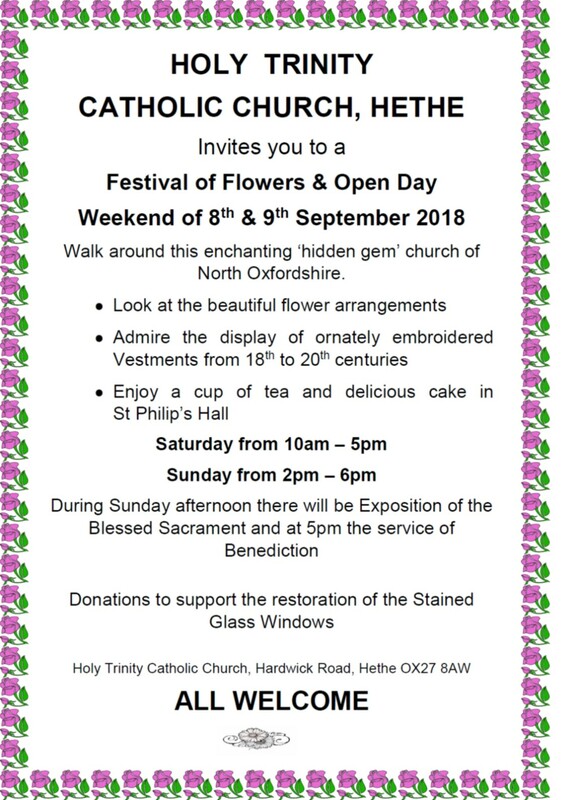 We had the Votive Mass for Pilgrims before we left Ely, in St Ethelreda's Church. 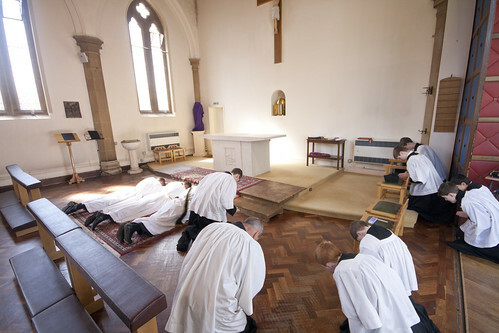 It was a Sung Mass with chant: we had with us an excellent chant schola, led by Gwilym Evans, a seminarian of the FSSP. 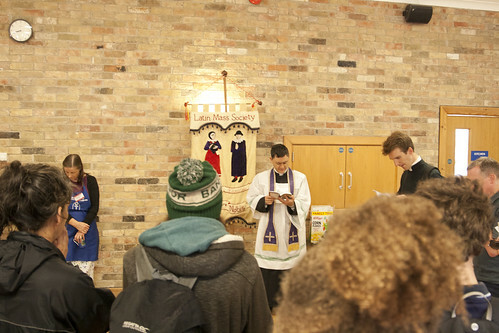 The Pilgrims' Blessing (from the Roman Ritual) was given by one of our chaplains, Fr Michael Rowe from Perth, Australia. Our other chaplain was Fr James Mawdsley FSSP. 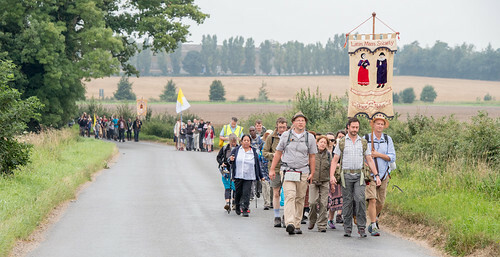 The Viganò story broke on the morning of the third day of the Latin Mass Society's Walking Pilgrimage to Walsingham. I started seeing it on social media at a rest-stop about 5 miles from the shrine, as I was tweeting our progress. So I come a little late to the party, and would much rather be writing about other, and more edifying, matters. But here are some thoughts, now I have got home. Catholics, indeed everyone interested in the Church, stand in dazed awe at an audacious pyramid of lies. Broader, comprehensive lies support detailed, lesser lies, in a intricate pattern, soaring to vast heights and covering an extensive territory, something like the fortress of Sauron, in Tolkien's Lord of the Rings: wall upon wall, battlement upon battlement, black, immeasurably strong, mountain of iron, gate of steel, tower of adamant. A small but indefatigible cadre of Catholic commentators (Austen Ivereigh, Massimo Faggioli et al.) are suggesting to us that this fortress of falsehood is to be found in Viganò's own 'testimony'. They see a pattern of deceit, motivated by frustrated ambition, and no doubt other unworthy things, being supported by a 'team' including various persons they do not like. If this were the case, the situation would be extremely worrying. This interpretation recruits as Viganò's co-conspirators prelates of far greater dignity and popularity than Archbishop Viganò himself. It is impossible to think of a public challenge to a Pope's authority as elaborately planned or supported by such senior churchmen in modern times, and coming on top of the McCarrick case and the Grand Jury report, the implications are dizzying. One could only say that, on this view, one statement at least of Viganò's memorandum is true: that the cracks perceived by Pope Paul VI as letting the smoke of Satan into the Church have become chasms. 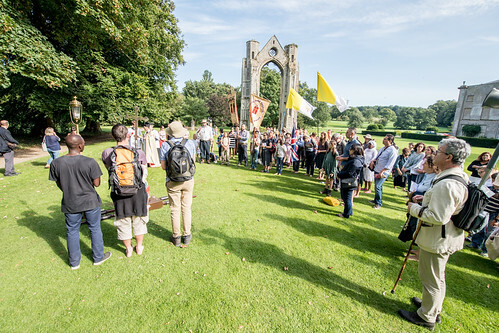 Blogging this week has been pushed aside by preparations for the LMS Walsingham Pilgrimage. I will also provide updates, with a bit of luck, on Strava. This is an exercise app. which allows users to upload routes and times of walks (/runs etc.) recorded as they are done. I plan to upload each leg of each day's walk at the stops. We'll see how well this works! Please say a prayer for the pilgrimage. We have about 65 pilgrims this year, slightly more than last year. Some strange things have been written on this crisis, but - in an otherwise helpful article - this deserves some kind of prize. I think it is useful, when addressing problems in the Church, to ask what we would be saying about a parallel problem in another institution, or a different problem in the same institution, and, if what we are saying about the the issue at hand is totally different, what justifies that difference. Flynn's bizarre reasoning illustrates such a contrast. Christ also, the spotless Lamb, was disfigured, by his enemies. Isaiah says of Him in prophecy: 'there is no beauty in him, nor comeliness: and we have seen him, and there was no sightliness, that we should be desirous of him' (Is 53:2). But again, Christ's beauty is hidden, rather than lost. Update: there is a fuller list of signatories on the LifeSite story here. In an unprecedented move, 45 Catholic academics and clergy have signed an Appeal to the Cardinals of the Catholic Church, urging the cardinals to tell Pope Francis that he must teach the authentic Catholic doctrine concerning capital punishment. 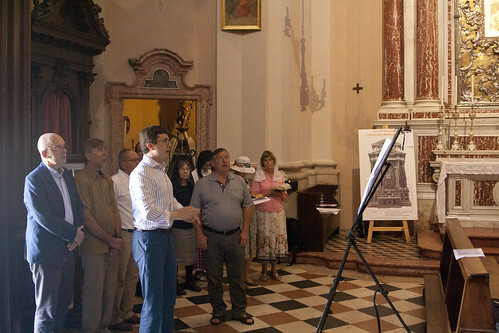 The appeal follows an addition to the Church’s Catechism announced by Pope Francis on August 2nd. The new paragraph, which is confusingly worded, has been taken by many inside and outside the Church to say that capital punishment is intrinsically immoral, and must never be used. Such a teaching would run contrary to many passages in the Bible, and to the teaching of the Church down the centuries. Catholics hold that while a pope has the right to clarify matters of faith and morals, he has no right to introduce new doctrines, or to contradict what the Church has always believed. They likewise hold that a pope must not seek to impose his private opinions on the faithful. The petition, which has been signed by professors of philosophy, theology, law, and history from Catholic institutions across the world, and by priests from several countries, calls on the cardinals to advise the pope that he must withdraw the offending paragraph, and that he must not ‘adulterate the word of God’. It also advises the cardinals that they have a serious obligation to warn the pope in this way, in order not to fail in their own duty toward God and the Church. 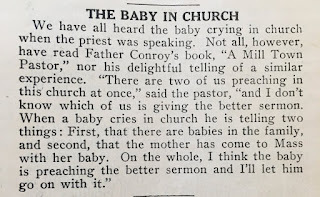 Every now and then the issue of babies crying in Mass comes up, and I thought this note from the early 20th century is worth preserving on this blog. The book from which this anecdote comes was published in 1921 (it is available as a reprint interestingly). 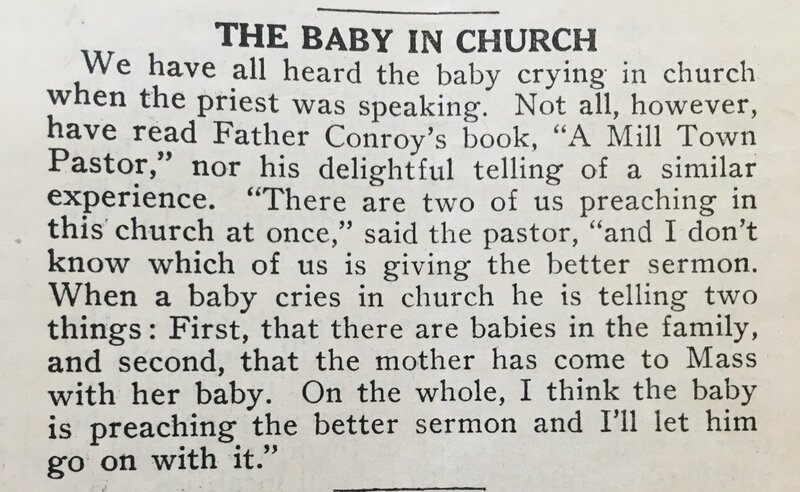 Timeless wisdom on preaching for hearing people (from a 1924 issue of “the Catholic Deaf-mute” newspaper). 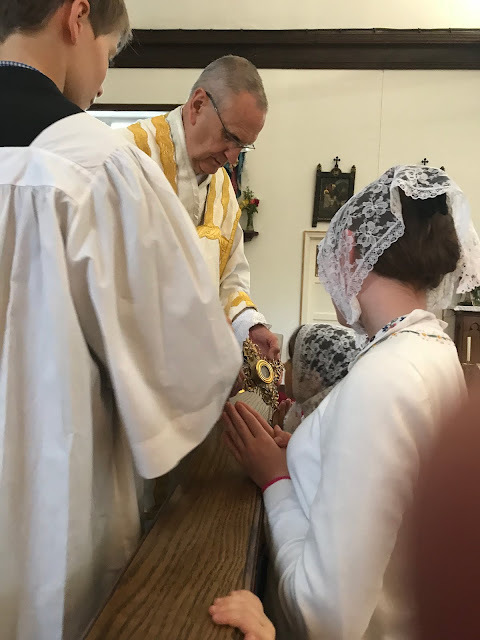 I've written about children and babies in church here (on Geoffrey Hull claiming that babies should not be there at all), here (on 'crying rooms'), and here (FIUV Position Paper on children and the Traditional Mass). 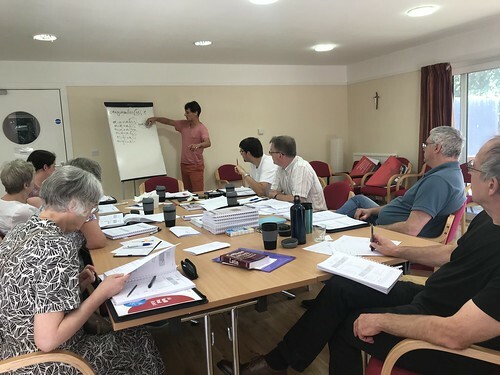 Last week the Latin Mass Society's residential Latin Course took place. 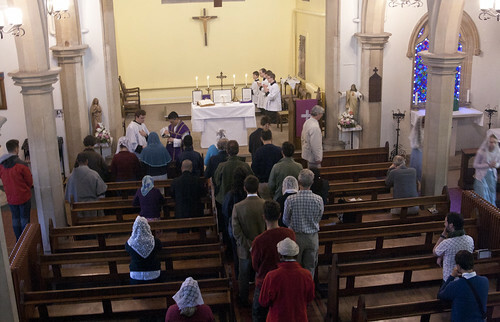 We were close to capacity in the venue, the Carmelite Retreat Centre at Boars Hill near Oxford. With the help of Matthew Schellhorn and a number of singers who were present as students Sung Mass was celebrated each day and Compline twice. 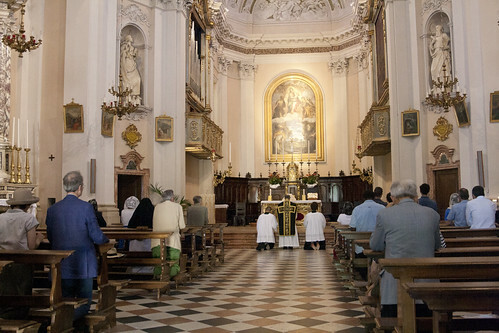 The two priests who attended as students took turns with Fr John Hunwicke, who was teaching, to celebrate the Sung Masses, as well as Low Masses before breakfast. In my last post, I suggested that what may be necessary in dealing with the crimes of our predecessors in the Church are two things: compensating the victims, and repudiating any ideological justification put forward for the crimes. My examples were anti-Semitism and paedophilia. My discussion of past crimes has, deliberately, focused on issues where the crimes clearly really did take place, and clearly are crimes. I don't want to give the impression that I want to accept every accusation against Catholics as true: that will lead to injustice just as surely as treating every accusation as false. 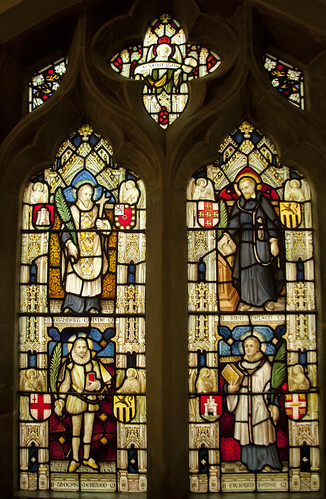 Nor am I, by any means, inclined to say that everything which has been done by Catholics down the centuries which does not meet the approval of modern liberals is a crime. Again, the hysteria surrounding the investigation of the recent past in Ireland shows that a lack of historical perspective, and extrapolation from insufficient information, can distort the picture to the extent that good people end up being depicted as monsters. Let us hope that the apology issued by the Associated Press news service over their own reporting of the Tuam excavations represents the high-water mark of this lunacy. Plenty of crimes, however, are real enough; there is really no need to gild the lily. Looking at the child abuse scandal, for example, it is increasingly clear that it was a problem which affected a lot of institutions at a particular period of time, but that does absolutely nothing to excuse its presence in the Church. The seriousness with which this plague infected the Church is mind-boggling, and one may be excused for asking: what can possibly wash this from us?